The living area of Beech lodge is open plan. The open plan desgin of the kitchen, dining and lounge areas allow everyone to engage no matter what they are doing. The lodge has digital television installed and a stereo. 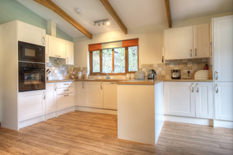 The large open plan kitchen area is fully equiped and has plenty of storage space for your essential provisions. The kitchen is fitted out with a fridge/freezer, washing machine and dish washer. 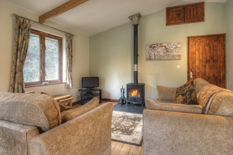 The lodge offers sleeping accommodation for up to four people - one twin and one double room. Both rooms are extremely comfy and coupled with the peace of the location, you are guarenteed a good nights rest. The bathroom is fitted with a basin, lavatory, bath and shower. A view from the lounge area of the lodge over looking the veranda.